According to the latest Baikonur launch schedule, GIOVE-B will be put into orbit on April 14 by Starsem, the company in charge of launching Soyuz rockets. The European Space Agency (ESA) is planning special events at several ESA centers in Europe to commemorate the event. Also known as the Galileo Satellite Test Bed – Version 2/B (GSTB-V2/B), GIOVE-B will ride a Soyuz-FG rocket, separating into final orbit on a Fregat module. GIOVE-B had been ready for launch in December 2007; however, a Soyuz Fregat launcher was not available at that time. ESA has taken advantage of the delay, however, and upgraded the spacecraft’s navigation signal generator so that it can broadcast the multiplex binary offset carrier (MBOC) signal on the Open Service, applying the latest agreement between the United States and the European Union on a common interoperable signal design. 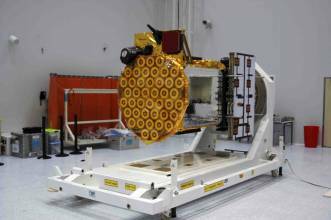 After GIOVE-B, the in orbit validation (IOV) phase will be completed with the launch of four additional IOV satellites currently being built by the European Satellite Navigation Industries (ESNI) consortium at locations across Europe. The first IOV launch will take place toward the end of 2009. The Galileo passive hydrogen masers are designed to keep time with an accuracy of around one nanosecond (one one-thousand-millionth of a second) in 24 hours — equivalent to losing or gaining a second in 2.7 million years. The rubidium clocks are accurate to 10 nanoseconds per day. On the political front, Galileo also appears to be back on a steady course. On December 18, the European Parliament gave final approval to the 2008 European Union (EU) budget, which includes full public funding for the system. 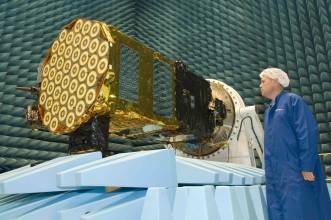 Under the new procurement methodology, the production of 26 additional operational Galileo satellites in three batches of 10, 10 and 6 will take place under open competitive bidding with a guarantee of second sourcing. Under the previous arrangement, ESNI had been expected to gain the full contract as well. Now the different batches of the final 26 satellites will probably be produced by competing teams. That appears to have created an opening for Germany’s OHB Technology to partner with UK-based Surrey Satellite Technology Ltd., which built the two GIOVE-A spacecraft, and seek to split the work with EADS Astrium and Thales, two members of the ESNI group that are expected to continue their Galileo partnership. An interesting sidelight: OHB’s Galileo effort is led by Alain Bories, senior vice-president for strategy and business development and formerly a vice-president at the Thales Group where he was deeply involved with that company’s Galileo activities. The new round of competition will open with a request for information (RFI) going from ESA to industry early in 2008, contracts awarded in the third quarter of this year, spacecraft delivery beginning in 2009, and a launches from 2010 through 2012.